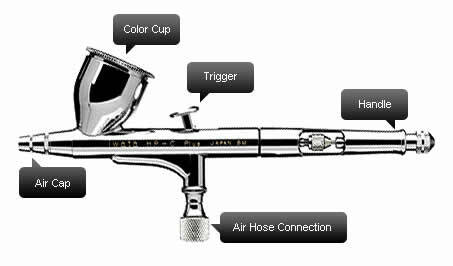 The airbrush is a unique art tool used to apply paints, inks, and pigments on to a surface using air pressure. Modern airbrushes are sophisticated instruments capable of pulverizing and spreading colors evenly over diverse surfaces from standard canvas supports to automotive body panels, t-shirts, scale models, even the human body itself! Because airbrushes are sophisticated tools requiring unique techniques, many artists feel intimidated by the prospect of incorporating airbrushing into their work. Airbrushing, though, is really no different from painting with a brush or drawing with a piece of charcoal. Airbrush art is simply another artistic medium that any artist with a little talent and patience can master through practice, just as oil paints or watercolors can be mastered. As with any medium, diligence and dedication are the keys to attractive airbrush work. MisterArt.com can't work on your airbrushing technique for you—you're on your own there! But MisterArt.com can and will work to offer you the very best discounts on airbrushing supplies online! We guarantee to offer you art supplies at the lowest prices on the Internet. If we don't already offer the lowest price on your favorite art products, we'll gladly match it. MisterArt.com is dedicated to making airbrushes and other tools affordable to talented artists everywhere. Now that you know where to find the best deals online, it's time to find the best airbrushing supplies for your project! This guide provides an overview of airbrushes and tools available online. The better informed you are when you shop, the happier you'll be with your purchase. Though the airbrushes used by artists today are elegant, sophisticated art tools, airbrushing techniques were being used millennia ago by our prehistoric ancestors. French cave paintings contain many examples of artists' hands being rendered in outline by spraying colored pigments through primitive tools like hollow reeds and bones. The airbrush as we know it was created in 1893 by Charles Burdick, a watercolor painter. Burdick invented a device that allowed him to render graduated shadings with a delicate finish using compressed air. As the 20th Century began, airbrushes based on Burdick's were used almost exclusively to retouch photographs. The first notable airbrush artworks appeared in magazine illustrations and advertisements as well as posters. During World War II, the use of an illusory third dimension in painting became popular, and the airbrush was used to full effect to achieve this look. After the war, however, the airbrush's popularity declined sharply, with the exception of its use in cartoon and sci-fi film productions. It was in the 1960s that airbrushing was adopted as a fresh artistic medium. Today, it's a great tool adopted by a wide range of artists. No longer limited to photo retouching or graphic design, it's been successfully applied to many media, from traditional painting to automotive graphics to set design. At the dawn of the 21st Century, more and more artists are awakening to the airbrush's possibilities. The airbrush hasn't undergone a whole lot of changes since it was invented in 1893. Though its design has been streamlined and modernized over the past century, all of the main components in today's airbrushes were present in the earliest models, as well. There are three main types of internal-spray airbrushes available online. Each type of airbrush affords the artist a different amount of control over the amount of air and paint being sprayed. Single-action airbrushes control air- and paint-flow rates by means of a button that operates the air intake. Artists using single-action airbrushes can't adjust the speed or quantity of their paint flow during use, but the flow of air is adjustable. Single-action airbrushes give very exact results and are great for beginners and hobbyists. Double-action airbrushes are a bit more versatile. These airbrushes are operated by a lever, and the intensity of the air and paint flow can be jointly adjusted while the airbrush is in use. Double-action airbrushes are highly precise and practical. They're used by pros and beginners alike. Independent double-action airbrushes are the most sophisticated type of airbrush available. As its name implies, the independent double-action airbrush allows the artist to regulate air and paint flow independently while he or she works. The independent double-action's operation is a bit trickier, but professional artists love its versatility. Mounting the reservoir on the side allows the working surface to be clearly seen, an essential feature for creating fine detail. The advantage of gravity feed is that colors can be added a few drops at a time and changed easily and immediately. Mounting the reservoir below allows large bottles of color to be used, removing the hassle of constantly having to add color. Single action airbrushes only allow control of air flow while spraying; the amount of fluid sprayed can be pre-adjusted, but the flow remains constant at that amount. Double action airbrushes allow the user to control both air and paint flow while spraying. This design gives more control over the spray pattern. No matter what sort of airbrush your project demands, you'll find the best prices online at MisterArt.com! Our VIP Savings Club members can save up to 75 percent on airbrushes and other art and craft supplies every day! In order to keep an airbrush in good working order throughout its lifespan, it's absolutely essential that it be kept perfectly clean and properly maintained. Airbrushes are delicate precision tools—any rough handling can cause damage. Water is a good and common solvent used to clean airbrushes. However, if non-water-based paints such as oils or acrylics are being used, the airbrush must be thoroughly cleaned with the appropriate solvent or thinner before being well rinsed with plenty of clean water. Because airbrushes are delicate, it's always wise to have any mechanical issues checked out by an authorized technician. MisterArt.com stocks a fantastic selection of cheap cleaning stations, lubricants, reamers, and other supplies to keep your airbrush clean and ready to paint! Because airbrushes need pressurized air to work, air compressors and propellants are a necessity. A compressor should supply constant, adjustable pressure for an even spray. Different airbrushes can operate at anywhere from 1 to 100 psi, so an appropriately powered compressor should be chosen to match the needs of the airbrush. Artists have a lot of choices when it comes to air compressors; a given model might use reservoirs, pistons, diaphragms, or innumerable other technologies to provide a steady, quiet airflow. Accessories like regulators, purifiers, filters, control valves, and more make it possible to upgrade even budget compressors. Although MisterArt.com has everyday discounts on compressors for all budgets, compressors are still major expenses for many airbrush artists. Luckily, there is a far more economical option available online. Compressed air cans are a relatively new product that provide a small dose of propellant perfect for sporadic airbrush work and inexpensive airbrushing systems. You can find the best selection of compressed air cans online at MisterArt.com! Frisket describes any masking film or spray used by watercolor artists to protect areas of a work from unintended change. In airbrushing, a frisket is used to mask off specific areas of an artwork's surface so that only the exposed area is covered with paint. The frisket is often crucial to airbrushing, because it allows artists to control excess paint spray, create special effects, achieve extreme precision, control edge attributes, and to expedite the airbrushing process. A frisket is fixed to a painting surface and then the portions covering the area to be painted are cut out of the material using a razor or scalpel. The exposed areas are then painted and the process is repeated using the cut pieces to mask their matching finished areas. When all painting is finished, the resulting work contains precise shapes with no overspray. Many friskets are a single sheet that covers the entire work, parts of which are removed by cutting into the sheet. These friskets are available in both matté and glossy finishes. Some friskets are also solvent-proof. Liquid friskets for precise work are also available. Airbrush mediums are additives that are combined with airbrush paints to change their properties slightly. Fundamentally, an airbrush medium is a mixing medium. It may be used to lighten the color values of all colors and does not affect the permanence. 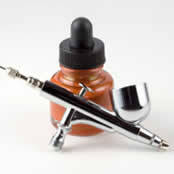 Some airbrush mediums may also be used to increase a paint's transparency or opacity or used as a top binder. Other mediums are designed to enhance the flow of colors and prevent the tip of your airbrush from drying out in extremely dry or warm conditions. There are mediums for paints other than airbrush colors, as well. By adding special thinners and emulsions to acrylic and enamel paints, their consistency can be altered so that these paints are able to be atomized with an airbrush. Using these products, artists can airbrush a variety of paints on to trickier surfaces, including scale models and auto parts. You can find a fantastic selection of airbrush mediums every day at MisterArt.com! Transparent Colors are for white and light-colored surfaces only. They can be intermixed with all other colors. Fluorescent Colors are for white and light-colored surfaces. They can be mixed with transparent, pearl, and other fluorescent colors. Opaque Colors are for both light and dark colored surfaces. They can be mixed with other opaque or transparent colors. Pearl Colors cover both light and dark colored surfaces. These colors have a shimmering metallic finish. They can be mixed with other pearl, transparent, and fluorescent colors. MisterArt.com stocks both individual colors and larger sets that include a variety of colors. In addition to paints designed specifically for the airbrush, a number of other pigments are also popular for airbrush use. Model paint, India ink, body paint, and more can all be mixed with airbrush mediums to create pigments fluid enough to be atomized by a typical airbrush. These paints greatly increase the number of surfaces on which airbrushes can be effectively used. No matter what kind of airbrush paint best fits your current project, we guarantee to offer the best deals online at MisterArt.com! Because airbrushes are delicate instruments that require much care and cleaning, it's not uncommon that airbrushes with a high usage rate require a few spare or replacement parts now and then to keep them functioning at their best. Nothing is more aggravating than to break or misplace an airbrush part in the middle of a project only to discover you have no spares! Luckily, MisterArt.com has a great selection of the most commonly replaced airbrush parts in stock, ready to ship anywhere in the U.S.! The parts that airbrush artists most frequently need are the airbrush components that are smallest or most prone to wearing out. Airbrush tips, needles, color cups, valves, and hoses are all parts which the average airbrush user can expect to replace at some point. Whether you're in the middle of an important project or simply dreaming up your next one, these airbrush parts and more are never more than a few mouse clicks away! As any artist is all too aware, paints that are in use constantly threaten to dry out. This is especially an issue with airbrush paints, since they are typically fast-drying. Certain mixtures of paints, pigments, and mediums can also be a massive headache to attempt to duplicate—in short, it's important to properly store airbrush supplies! Naturally, we've got the solution! Glass storage bottles with gaskets and lids ensure that airbrush paints stay fresh and ready to atomize. What's more, our glass bottles, gaskets, and lids are sold separately for convenient replacement of only the parts that you need! Airbrush storage bottles are made of thick, hard-to-break glass, and the lids are metal with an enamel finish. Our replacement gaskets are cork, the style preferred for liquid storage. Since we're MisterArt.com, we offer deep discounts on all our airbrush storage supplies every day! Our fast shipping ensures that your paint won't have a chance to dry out. While the most common form of airbrush art involves freehand manipulation of the spray, templates are gaining in popularity, especially for more common designs that must be reproduced many times over. Stencils are especially popular with artists who use airbrushes to customize the paint jobs of their automobiles, motorcycles, scale models, R/C vehicles, and other surfaces. Often, airbrush templates are designed to be used alone with freehand techniques. However, sets are available that are precision-cut to complement each other, so you can make your designs as true to the original art as you want! Our airbrush templates are solvent-proof, cut with laser precision from space-age polymers so that you can clean and use them again and again. You'll find the best selection online at MisterArt.com! Just getting started? Want to give airbrushing a try? Got a small project that requires a little airbrushing to finish off? Then you're in luck! MisterArt.com stocks a great selection of sets and kits that include everything an artist needs to get started airbrushing today. Sets and kits are perfect for beginners and hobbyists to affordably get their feet wet using real airbrushes, paints, and supplies. You won't find a better selection anywhere else online, from basic airbrush kits to sets including dozens of colors, templates, lessons, even compressors! Spray booths are handy art tools designed for the studio or work area where sprayed materials are used frequently. Essentially, spray booths create cubicle dividers that prevent paints, adhesives, and other sprayed materials and fumes from contaminating surrounding areas. The ideal booth accommodates flat or 3-D objects. It's perfect for crafters, model builders, hobbyists, and commercial artists! Want to know more about airbrushing? MisterArt.com offers low prices and fast delivery of thousands of books, magazines, DVDs, videos, manuals, and software related to airbrushing and other artistic media. Check out our library today!